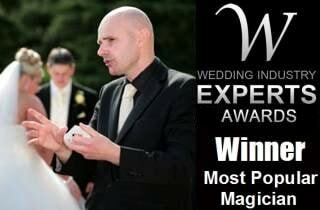 David's phenomenal magical act is ideal for your wedding in Leamington. Friends and family will be profoundly impressed. 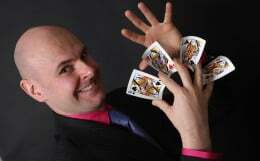 For parties in Leamington, David Fox is the first choice magician. Your event is guaranteed to be a spectacular success. Many Leamington businesses book David Fox for their corporate events to ensure the highest quality of entertainment. Are you searching for a first class Magic Circle magician in Leamington Spa? Are you in the process of organising a special event in and around Royal Leamington Spa? You have visited the website of one of Warwickshire's leading entertainers! David Fox is always guaranteed to make any occasion marvellous, magical and highly entertaining. His magic is slick, contemporary and ideal for all age groups. There are a whole host of locations throughout Leamington which are perfect for David's exceptional talents, from The Royal Pump Rooms on The Parade, to the Woodland Grange Hotel on Old Milverton Lane on the outskirts of this historical town, this magical master is always certain to mesmerise everyone present. David's incredible skill was highlighted when he was awarded the 2014 accolade for 'Most Popular Wedding Magician'. Securing the most votes both nationally and internationally was a fitting endorsement of his magical abilities and customer service skills. Previous clients around Warwickshire and the Midlands include: Toyota, Sytner BMW, Hilton Hotels, Marriott Hotels, Experian... the list goes on. Contact David Fox now for your next important red letter day event in Royal Leamington spa.